Is it possible to open an RSTAB file in RFEM or vice versa? 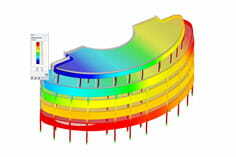 In RFEM it is also possible to open and further process structures already modeled in RSTAB with load and load cases. This may be necessary, for example, when it is determined during the model input that it makes sense to include surface elements such as wall plates etc. in the existing RSTAB model. In order to open an RSTAB file in RFEM, the "Open" dialog must change the file type to either "RSTAB file type" or "All files". This not only displays the RFEM files, but also all the RSTAB files stored in the selected directory. After opening the RSTAB file, the model can be saved as an RFEM file and processed further. However, it is important that, for example, already created printout reports or input data are not adopted in add-on modules. An existing RFEM 5 file can be read in RSTAB 8 by renaming the file extension from * .rf5 to * .rs8. Again, all module inputs and expression logs are deleted. 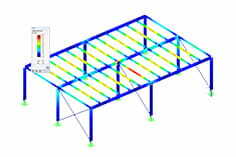 It should also be noted that only truss structures are accepted in RSTAB (surface elements are deleted).